We know we have been MIA. But we are back! Exams are done and dusted. Finally. Exciting things to come these holidays. So watch this space. To kick it off I've got a wishlist post. I love Korean products. They are great quality for the small price that you pay. The companies also come out with the most innovative products (or perhaps gimmicky?). Sometimes these become a hit in the Western beauty world too, much later though. BB creams ring a bell? There are so many products that I want to try right now so I am breaking this wishlist into 4 different parts. Face, eyes&lips, skincare and other. 1. Innisfree No Sebum Mineral Primer: This was voted one of the best products on the popular Korean beauty show Get it Beauty during a blind test. 2. Holika holika Aqua Petit Jelly BB Cream: One of the most raved about BB creams out there. Even Michelle Phan loves it. 3. The Saem Eco Soul CC Cushion: I have wanted to try the new CC creams. 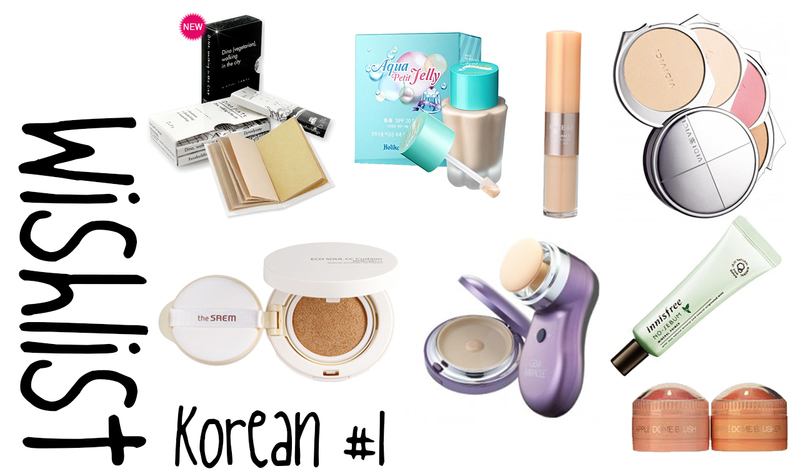 There's also a new craze in Korea with "Cushion" creams. They are a lot more moisturising. The Hera UV Mist Cushion is meant to be amazing but definitely out of my budget right now. 4. The Saem Gem Miracle Motion BB Foundation: This looks like a cheaper alternative to the very popular (in Korea) Han Kyung Hee Vibration Foundation. Interested in trying a foundation that works with a patting applicator. 5. The Face Shop Face it Concealer Dual Veil: Also another winner from Get it Beauty. 6. Dinoplatz Walking in the City Powder Paper: I was purely attracted to the packaging of this. Not going to lie. And I have not tried any products from Too Cool for School before. 7. Nature Republic Apple Dome Blusher: I really want to try a nice orange/peach blush because I can't find any Western ones that really suits me. And the whole dome thing looks fun to use. 8. Vici vici Small Face Case in All That Face: Way out of my budget but maybe someday. It's a convenient product with the different layers contained products that you will need for a full face base. How gorgeous is the packaging? I regret not buying more makeup the last time I was in Korea. So if I were to go back these are probably some of the things I would pick up. Congrats on finishing exams! The Holika Holika bb cream has been so raved about lately so I'm quite curious as well. Thanks! Yeah so glad to not have to think now. haha. Oh yes, that is one product that I am definitely forcing Court to bring back for me. I want the Aqua Jelly!!! Love the novelty of Korean Skincare and makeup, so much fun!! Really hope you both will have a go, I'm keen to read your answers!